Patches of bright yellow, bearing a promise of spring: exactly what I like to see in my February garden. Some snow has fallen since I took this photo a couple of days ago, so I know we’re not completely out of the winter woods yet. Nonetheless, as I look at these little crocuses on my computer screen I feel reassured by their cheery, upturned faces. They seem to express an utter joy in being alive, and they tell me that spring is almost here. They also remind me of the energy that comes to plants and people alike as temperatures warm and the days grow longer. With the start of a new growing season, there’s always a lot to be done, so I’ll soon need to shake off my winter cocoon and get moving again. 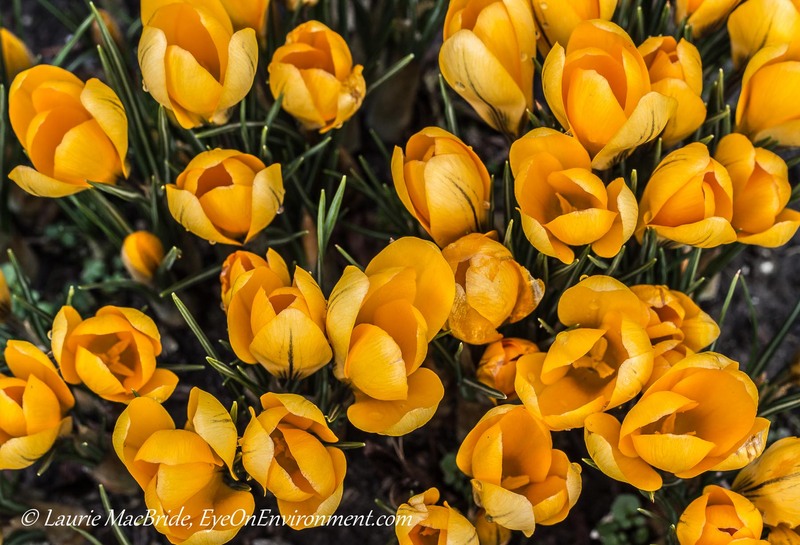 Posted by Laurie MacBride, Eye on Environment on February 22, 2014 in Garden, Musings on Life and tagged colours, crocus, energy, flowers, joy, nature, photos, plants, spring, winter. Thanks Robin – though wouldn’t you know it, today it’s totally white outside! Winter’s not quite done with us yet. What a happy image! Sweet little crocuses. I’d love to see spring on Gabriola — and your garden — one day! I’ll keep my fingers crossed for that, Sherry! It’s been snowing a bit today, so doesn’t feel much like spring – but fortunately the crocuses say otherwise. Your yellow crocuses warm my heart and make me conscious that spring is just around the corner, despite the fact snow is falling. Glad to hear that! If it’s any consolation, it’s stopped falling (at least for now) here on Gabriola – maybe yours will stop soon too. Thanks for your kinds words on my post.